Choice of ground beef patty or chicken breast and choice of brioche bun or garlic Texas toast. Topped with bacon, lettuce, tomato, BBQ sauce, Cheddar cheese, fried onions and jalapenos. 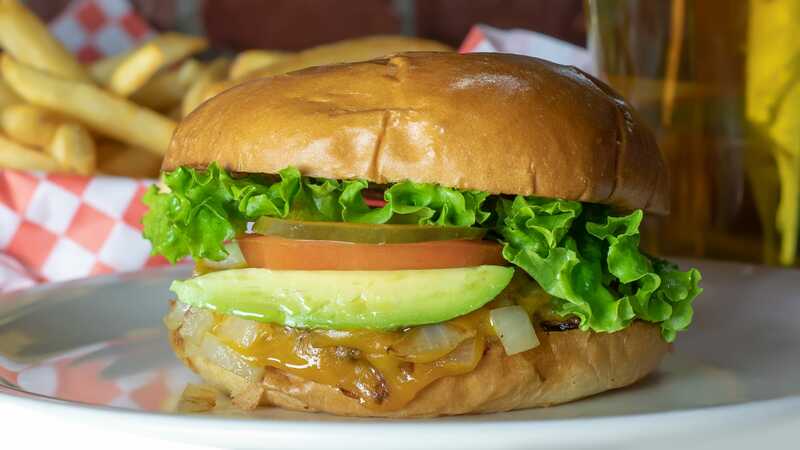 Avocado, grilled onions, Cheddar cheese, lettuce, tomato, pickle and 1000 island. Ground beef, Cheddar cheese, caramelized onions, pickles and 1000 island dressing. Served on Hawaiian rolls. With cream cheese, bacon, fried onions and jalapeños. Served with lettuce, tomato and mayo. Roasted Anaheim chilies, with guacamole, Cheddar cheese, sautéed mushrooms, lettuce, tomato and mayo. All Sandwiches come with Cheddar cheese, mayo, lettuce, tomato, pickles, onion and fries. Toppings: Bacon, Canadian bacon, grilled chicken, ground beef, Italian sausage, pepperoni, bell peppers, olives, garlic, jalapeños, mushrooms, onions, pineapple, extra cheese. Our salads are made with the freshest ingredients. All our dressings are made in-house. Choice of ranch, bleu cheese, balsamic vinaigrette, honey mustard or 1000 island. Mixed greens, tomato, hard boiled egg, bacon, Jack and Cheddar cheese tossed with BBQ ranch. Topped with grilled chicken and fried onion straws. Served with garlic toast. Breaded chicken strips on mixed greens with tomato, black olives, egg, Cheddar and Jack cheese and your choice of dressing. Served with garlic toast. Tossed greens with candied pecans, craisens, cucumbers, avocado and bleu cheese crumbles tossed with raspberry balsamic vinaigrette. Served with garlic toast. Mixed greens topped with grilled chicken, tomato, bleu cheese crumbles, bacon, egg and avocado. Served with garlic toast. Cilantro lime shredded chicken, beans, Cheddar and Jack cheese stuffed into a flour tortilla, fried and topped with green salsa, melted cheese, guacamole and sour cream. 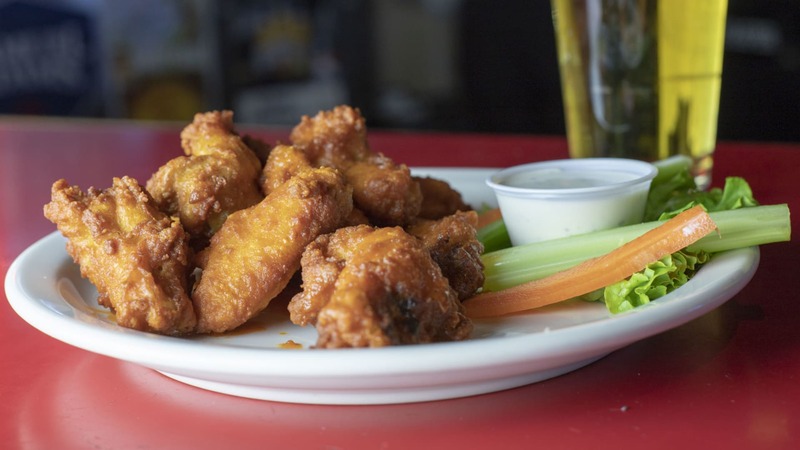 One 1/2 lb of our specialty wings. Beer battered cod served with fries and tartar sauce. Chicken, carnitas or avocado tacos. Try any of our calzones with a dinner salad. A taste of all your favorites. Wings, flautas, taquitos, Irish nachos and a chicken quesadilla. Served with guacamole & ranch. Rolled flour tortillas stuffed with slow roasted chicken, golden fried and served with guacamole, salsa and ranch. Slow roasted pork with house made BBQ Sauce, Jack and Cheddar cheese, topped with fried onion straws. Corn tortillas stuffed with shredded pork then fried to perfection. Served with guacamole, Jack and Cheddar cheese. Crisp golden fries tossed in spicy Cajun seasoning. Topped with melted Cheddar and Jack cheese. A huge plate of fresh tortilla chips topped with melted Cheddar and Jack cheese, tomatillo salsa, beans, tomato and green onion. Served with guacamole and sour cream. Breaded chicken breast tossed in Buffalo sauce. Served with lettuce, tomato and mayo. Choose buffalo, BBQ, garlic Parmesan, habanero, mango habanero, chipotle honey. Choice of slow roasted chicken or carnitas pork, tomatillo salsa, Cheddar and Jack cheese. Served with guacamole, sour cream and salsa. A full pound of French fries topped with melted Cheddar and Jack cheese, bacon, tomato and green onion. Served with ranch. Golden fries topped with Italian seasoning, pepperoni, Canadian bacon, Parmesan cheese and melted Mozzarella. Fresh beer battered cod and fries served with tartar sauce and lemon. 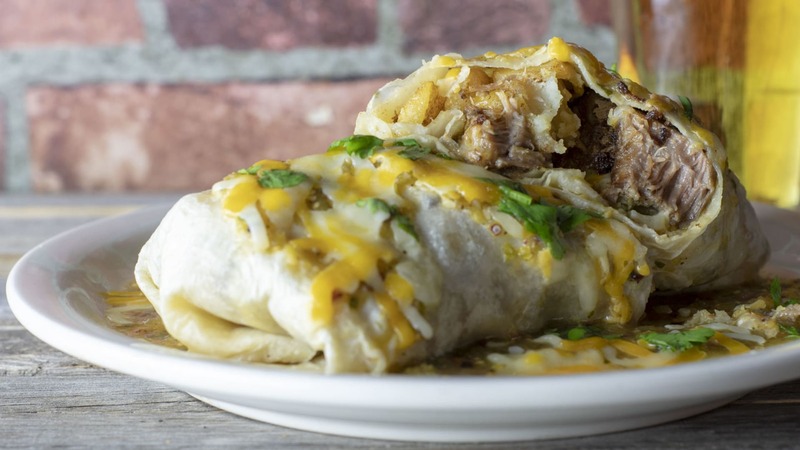 Chunks of slow roasted pork, potatoes, Jack and Cheddar cheese stuffed into a flour tortilla. Topped with green sauce and more cheese. All taco platters come with two tacos, rice, beans and salsa. Lean strips of marginated steak. Deep fried topped with chipotle cream sauce. Chicken breast slow braised with cilantro and lime.